Play virtual secret agent in Spy Rise, a 5 reel, 40 payline jackpot slot game from Playtech. This espionage adventure allows you to up your stake level and, in the process, upgrade the payouts on offer from the 4 top paying symbols. There’s also a free spins round complete with win both ways payouts. Play on all devices from between 20p and £300 per spin. 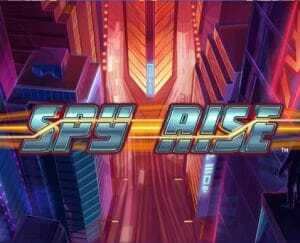 A neon lit cityscape filled with sky scrapers forms the backdrop to the action in Spy Rise. The reels feature futuristic currency symbols as well as a watch, sports car and female and male agents. The male spy is the top paying symbol. Land 3, 4 or 5 of these and you’ll receive an award of 3.75, 7.5 or 50 times your total stake. Those same payout amounts are on offer from the wild which can land on all 5 reels and substitute for everything apart from the scatter. Spy Rise gives you the chance to increase your stake and upgrade any or all of the 4 higher value symbols with the Feature Bet Mode feature. For example (and with round numbers), at stakes of £1 per spin, it would cost you £1.50 to upgrade the watch, £2 to upgrade the watch and car, £2.50 to upgrade the watch, car and female agent and £3 to upgrade the watch, car, female and male agents. For example, with feature bet level 4 active, 5 male agents will get you 83.33 times your stake. Spy Rise also comes with a Free Games feature which is triggered by landing the Spy Rise logo scatter on reels 1, 3 and 5 on the same spin. You’ll then receive 10 free spins on a win both ways machine. Any upgraded symbols in play on the triggering spin carry over to the feature. The design here is done cartoon style and is decent enough. Likewise, the high tech soundtrack. The gameplay is relatively simple too. The symbol upgrades can deliver some good rewards but at a price – if you’re lucky, you could pocket 3,333.33 times your stake if you fill the reels with male agents using feature bet level 4. The Free Games feature can have its moments too thanks to the win both ways payouts. That’s certainly the case if you carry over the upgraded symbols. This secret agent adventure isn’t exactly 007. It’s solid enough if you like the espionage theme but it doesn’t offer enough in the way of design or features to really get the pulse racing. I much prefer The X-Files, also by Playtech, which features iconic agents Mulder and Scully.